Public Events. Subject to change. We also arrange a number of private events for members throughout the year (such as our annual banquet! ), so why not join us? Or, book us for one of your events? On a brilliantly sunny May Bank Holiday weekend, old stagers Vikings of Middle England - otherwise known as Tÿrslið - unveiled their rolling scenario for 2004 - "The Revenge of Ivarr the Boneless". The setting for this, the group's first major event of the new season was Tutbury Castle in Staffordshire. VME have become familiar performers at the castle, which was originally built in the 1070's for one of William the Conqueror's Barons. Their last visit was in November when they staged the terrifying Holmganga, reported in Skirmish No.28. The foundations of the 11th Century chapel made a fine setting and a natural amphitheatre for the opening two scenes of the day's presentation. Once again utilising the tried-and-tested format of a rolling scenario, Tÿrslið brought to life the mysterious tale of Ragnar Lothbrock and his vengeance-seeking sons. As the Narrator informed an enthralled audience of -"a time in the Dark Ages where myth becomes legend, and the legend becomes History" the opening scene commences with the capture of Danish King Ragnar Lothbrock. Struggling he is brought before Ælle, usurping King of Northumbria. Ragnar receives short shrift and is consigned to Ælle's snake pit. As he is led away, Ragnar shouts back at Ælle, "The young pigs would be grunting if they knew of the old boar's fate!" On advice from Fr. Edwin, Ælle's counsellor, the king reconsiders, preferring to keep Ragnar as a bargaining chip. He is, however, too late to prevent the death of the Viking leader. We are then transported, via music and the narrator's link, to the second scene - a time of celebration at the home of Ragnar's family in Denmark, although with painstaking attention to accuracy, the name "Denmark" is not used, as it did not come into use until after the period being portrayed. The narrator sets the scene, introducing each of the characters, and we meet such personalities as Halfdan of the "Wide Embrace", Sigurd "Snake-in-the-Eye", Bjorn "Ironside" - clad of course in ring-mail - and of course the eponymous central figure - Ivarr "he Boneless" The whole scene provides a tableau of Viking festivity; games of dice, hnefetafl, arm-wrestling, axe-holding and general socialising. The celebrations are interrupted by a messenger hotfoot from the quayside. Pushing past the guards, the envoy drops to one knee and breathlessly gasps out the awful news of Ragnar's death. There is instant uproar at this news and the scene records the various filial reactions as documented in the sagas. Halfdan, who had been pairing his nails, cuts his thumb to the bone; Sigurd drives a spear into his foot ; Ubbi crushes a hnefetafl piece so that the dust runs through his fingers. Only Ivarr remains impassive and composed. He calls for silence and commands that the festivities continue. Played in the round, with the audience on three sides, the central characters (i.e. the sons of Ragnar) take centre stage, whilst the supporting cast melt into tableau on the periphery. This device worked most effectively. The brothers make plans for a punitive expedition to England. The scene closes with a discussion of their preparations and whether theirs should be a swift response or not. Avenging the death of his father was but one aspect of a more far-reaching agenda on the part of Ivarr The Boneless. He had set his sights on an altogether more ambitious project. The narrator informs us that History records the invasion of 866 as the greatest Viking force ever to be assembled. It is known as The Great Army. The use of radio mics meant that the not inconsiderable crowd could follow every detail, thus adding to the professionalism of the performance. 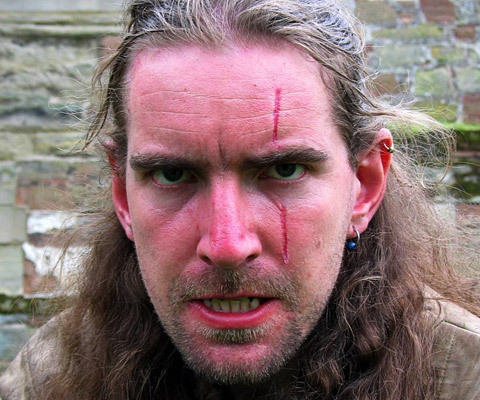 The Tutbury venue is an ideal setting for re-enactments of various periods, for whilst the ruined battlements and earthworks date from the 1400s, the whole ambience of the castle and grounds lends a unique atmosphere to all things historical. Although being the main attraction, VME, unlike their August Bank Holiday spectacular at Rockingham Castle, were supported by others from falconry to ferret-racing! Visitors not patronising these supporting acts, wandered freely around the Living History encampment of about thirty tents, where all the usual crafts were on display. The village was a hive of activity; children ran and played and dogs barked. Other villagers played board games or cooked, the smell of their cooking mingling with the heady aroma of incense wafting from the Saxon chapel. The forge-master was busy manufacturing small Viking pendants in pewter, and the armoury was awash with enthusiastic visitors, eager to learn about Dark-Age weaponry. Behind the encampment the 'Have-a-Go Archery' stall proved to be extremely popular and elsewhere in the village people could strike their own Viking or Saxon coin. As always, members of Tÿrslið were at pains to inform and educate, fielding questions from all angles. The backdrop for the final two scenes in the unfolding saga of Ivarr The Boneless, was the earthworks surmounted by rampart, which runs from the North Tower to the South Tower, this latter structure forming the gateway to the City of York. 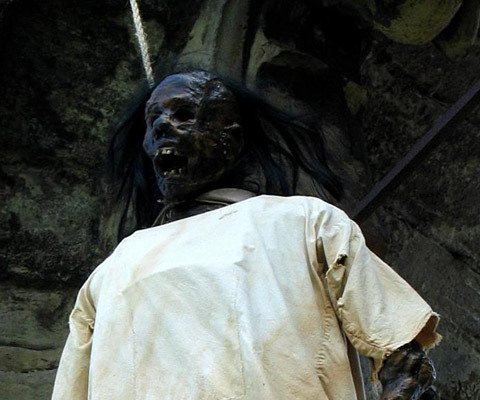 As a grim reminder of the fate of Ivarr's father, the rotted corpse of Ragnar Lothbrog still hangs from the battlements of York. The crowd, safely ensconced behind the safety barrier, wait in hushed anticipation as three of Ælle's guards loaf in the gateway, leaning on their spears. The Tÿrslið introductory music - from 'The Lion in Winter', signals a movement at the far end of the arena, which attracts the guards' attention. Five Vikings are approaching. With their spears at the ready the guards advance and challenge the intruders, who turn out to be Ivarr, his standard bearer and three of his brothers. The guards suspect that these strangers are the very same who stole horses in the region recently. At this point, the lookout atop of the South Tower shouts a warning that the King is approaching. Ælle emerges from York with the bulk of his army in support. He insults the brothers echoing Ragnar's reference to 'little pigs' and referring to the story found in the sagas, that the great leader had disguised himself as a woman to get close to Ubbi's mother. Ubbi is outraged by the taunt, but Ælle believes his superior numbers makes him invincible. However, Ivarr, that master tactician nods to his brother and on Ubbi's command the main Viking army materialises through the crowd to surround the Northumbrians. Two of Ælle's men die in the early clashes, their tunics stained with their blood. Ælle's force is cut to ribbons and although the invaders suffer some casualties, the Northumbrians are utterly routed. Those who are able flee to join Ælle's rival, Osberht. As foe Ælle himself, some sources say that Ivarr had him blood-eagled, but evidence for 'blood-eagling' is scant to say the least, and many scholars doubt if this form of torture actually existed. The jury is still out on this one. However, Tÿrslið dealt with the fate of the hapless usurper in a most adept and impressive way. As the last survivors are put to flight, the luckless king is dragged forward and thrust to his knees. His tunic is ripped open to expose his bare flesh. Each brother then steps forward, identifies himself to the rapt spectators with a suitable epigram, and delivers one or more cuts to the unfortunate king. As he sees his life blood drain from him with every cut he screams horribly. Cut after cut is delivered including, hamstrings. Ælle's body is criss-crossed with bleeding slashes until eventually Ivarr finishes the gruesome task by cutting the throat of his father's killer. The narrator concludes the scene by saying "Such were the wounds left on the body of Ælle, that his flesh looked as if it had been ripped by the talons of Eagles." Once more, the visitors drifted away from the arena to the various sideshows. The strains of Ned, the Folk Singer and the smell of burgers and hot-dogs gave the flavour of the fun-fair and for a while the spectators were able to return to the 21st century whilst still musing on the outcome of the events still to be played. Few people have even heard of Ivarr 'The Boneless', and fewer still know that he was King of Dublin and was known as 'King of the Northmen of all Ireland and England.' Dark-Age History is riven with myth, legend and mystery, often with limited evidence, and offers many areas open to interpretation. Tÿrslið demonstrates in its performances, the unerring skill of taking an available piece of history, augmenting it in an innovative and ingenious way, so as to present a credible reconstruction based on the sagas and a plausible interpretation. As one member put it, "Most of what we portray is historically accurate, and the bits we can't prove, could be." Sated by a surfeit of burgers, ice creams and fizzy drinks, the crowd return to the arena to first watch a display of falconry and then to witness the concluding act of the drama that they had been following throughout the day. On the dot of 4.30 the now familiar strains of 'The Lion In Winter Theme' breaks the silence, and the Northumbrian army of Osberht, the erstwhile King, enters the arena. It is 867 and Osberht remains Ivarr's only obstacle. The Viking leader has allowed his brothers Fridlef, Eric, Bjorn and Sigurd to return to Scandinavia and he, Halfdan and Ubbi now control York. The Tower lookout sounds several blasts on the horn and gives the alarm. From the great gateway, the Viking horde sallies forth and the two forces meet on the plain. The usual trading of insults, threats and imprecations take place as a prelude to the battle. Both Osberht and Ivarr speak via radio mikes, which, despite some sound dropout nonetheless added a greater dimension to the fighting - underscored by some atmospheric background music. Although History records the victory of Ivarr over both Northumbrian kings (probably in the same encounter), presenting a scripted battle takes much of the spontaneity out of the performance, at least from the viewpoint of the participants. This problem has been satisfactorily solved by Tÿrslið, who performed this final battle as a free fight, allowing the narrator to redress history. It works! In the opening clashes neither side gains advantage. Blood is spilt however, as two of the Northumbrians fall to Viking blades. Deadlock ensues as the numerically superior Angles desperately seek to outmanoeuvre the more heavily armoured Vikings. The conflict is fierce; some might say awesome. Osberht's tactics win the day [reversed on day 2!] aas he attacks using two ranks in quick succession, supplemented by a flanking manoeuvre by a party of spearmen. The spectacle of such a battle is both terrifying and breath taking, as the noise of steel against shield and the delivery of full-blooded, swinging blows chills the blood in one's veins. The narrator informs us that the Viking force has received a temporary setback and Osberht is victorious. As the triumphant Osberht gives thanks to God for victory and Ivarr and his brothers retreat to lick their wounds within the city of York, the poignant strains of Barber's Adagio for Strings floats over the blood-soaked battlefield, now bestrewn with the bodies of the dead and dying. Mournful cries of bereaved wives and the heart wrenching sobbing of newly fatherless children make the scene particularly moving. Northumbrian jubilation is short-lived however, as in a matter of days Osberht is killed in battle and the Viking victory is complete. 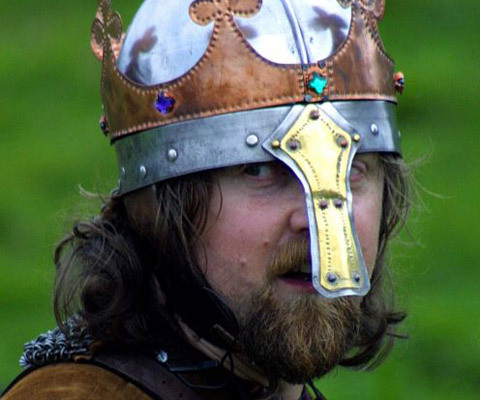 Ivarr raises a 'puppet' king - Egbert - in Northumbria and his brother, Halfdan 'Wide Embrace' becomes the first king of a Viking York - renamed Jorvik. Ivarr and Ubbi go south to East Anglia where they have King Edmund ritually sacrificed and that kingdom too becomes a Viking realm. In 870 Ivarr returns to Dublin where he remains as King until his death of natural causes three years later. He dies peacefully - laden with riches, seemingly invincible in battle and resolutely heathen. Winston Churchill said of Ivarr's end, "Thus it may be that he had the best of both worlds". 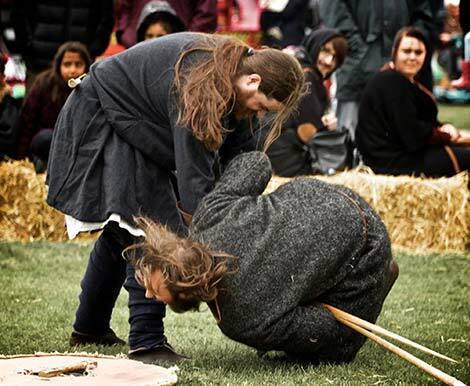 Once again, Tÿrslið had demonstrated their professionalism and their ability to educate, entertain and thrill a crowd of two to three thousand people with yet another quality performance of frighteningly realistic combat and evocative drama. Their reputation can only be enhanced by this performance. This was staggeringly good entertainment.